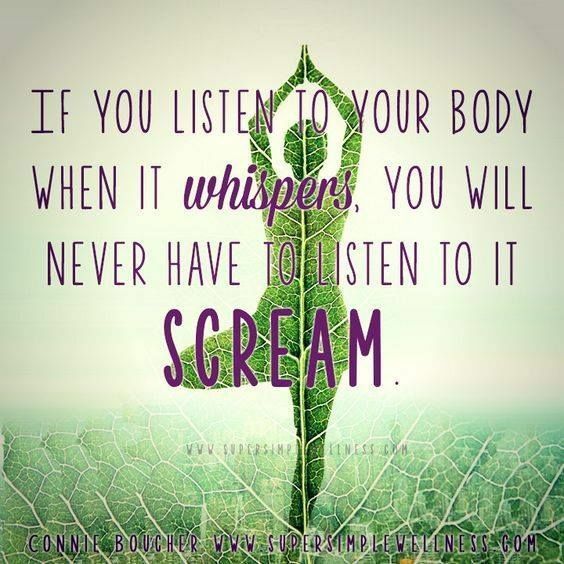 Surely, your body is talking – but – are you listening? Have you thought about how amazingly awesome your body is? Think about how it performs for you day and night and how it communicates with you. Maybe we just need to learn the language. Pain means there is something to address – physically and emotionally. Don’t mask it; numb it; ignore it – address it. For me, digestive issues will be my first sign of stress even before I realize it consciously. What symptom does your body display when you are stressed? An accident or illness is a wake-up call. Do you hear it? Disease is an opportunity for you to grow. Take a look at how it may have changed your life. How can you view the situation as positive or make positive changes because of it? Anxiety is a sign that you are not pursuing your life purpose. What are you ignoring? GIGO (Garbage In Garbage Out). Understand that what you put into your body directly affects how you feel both physically and emotionally. If the body asks for sleep then – dang it – sleep. …Don’t tell me you can’t nap. Just try it. Stress – what can you change? There’s no honor in an overloaded schedule or in being perpetually stressed – there’s just illness. Adjust your schedule or your outlook. Meditate. Breathe. Get outside! There is incredible energy in the earth, the sun, the wind, fresh air and rain. Allow your body to absorb it all. Do not fear nature. Contrary to what you hear on the nightly news – it won’t kill you. Depressed? How afraid are you to investigate what it is that depresses you? Knowledge is power. Please, please, please – justify some pleasure in your life. Daily – throughout your lifetime. We are meant to enjoy our time on earth – not struggle through it. Relationships. Only spend time with people who make you feel good. Period. Also, learn to enjoy time with yourself. Environment. This is more important than you think. Is it clean, sun-filled with fresh air? Is it comfortable? Does it have colors that you are drawn to? Posted by olivebranchretreat. Categories : Uncategorized. Tags : Body, Health, Wellness.